I said it that way because... is there anybody in this world who does not relate Venice to Italy and tourism, immediately? It's hard to talk about such a unique, unbelievably striking town. Nothing compares to it. Venice's history begins with an escape : this explains why in the heck with plenty of room on the mainland yet to occupy, the first Venetians chose to build a town laid on 118 small flat islands. Some people think of the Veneto's capital as just like a big amusement park. Kind of a disneyfication process, I dare say. But this ancient Italian town has been for centuries way more than just the today's Venice of tourism. At the peak of its power it was La Repubblica di Venezia, the queen of the eastern Mediterranean , encompassing many territories, from Histria to Dalmatia and its islands, as far as some today's Greek Islands. Home to a great composer like Antonio Vivaldi, a traveler like Marco Polo, a tombeur de femmes like Giacomo Casanova, this old maritime Veneto's town embraces art, great architecture, entrepreneurial culture and romantic love. Read 20 interesting facts about Venice, from the number of its gondolas and bell towers to the causes of its depopulation. No need to say, you can not drive cars or motorbikes, not even bicycles in this streets of water town. Venice in Italy is the only totally car free town, and this is a luxury that adds up to the uniqueness of this lagoon town! If you want to arrive to the historic town by car, or by motorbike, your only option is to park on Piazzale Roma, in the artificial Tronchetto island. From there you can go to the historic town and San Marco square either by foot or by the No.2 vaporetto, the public water bus. If you prefer to park your car in the mainland and get by train, you will arrive onto the Venezia Santa Lucia train Station, the gate to the historic town. No matter how, you have to pass through the last stretch of land linking the mainland to the historic town, named the Ponte della Libertà (Liberty bridge). if you arrive by car - which I do not recommend if you want to save money - or motorbike, and you want to park as close as possible to the historic centre, drive through the Ponte della Libertà. Once at the end of the bridge you arrive to Piazzale Roma . Here, there are some safe parking areas with prices ranging from 16€ to 40€ a day. Please note that during some of the more crowded periods like the Venice carnival, you should book parking in advance. if you prefer, you can park your car in the mainland, that is cheaper. The best way is to park in Mestre, the mainland suburb of Venice, and take the train at the Venezia-Mestre train station. The train goes on the bridge, as well, ad gets to the last stop, Venezia Santa Lucia, right next to Piazzale Roma. by plane, you can not make a mistake, the best way is a flight to the Marco Polo Airport. From there you can reach Venice (Piazzale Roma)in 20 minutes by a regular bus service. From the airport, you might also take private water taxi. But watch the price, no less than 100-150€. Traveling with a group of people makes it more convenient as you can share the cost. Please note: you landed to the Marco Polo airport and you are going to visit Venice for a day or two, and after that drive towards a different place across Italy. In this case do not hire a car when you arrive to the airport. Venice has no streets, remember? You do not want to leave your car parked the entire time while visiting Venice, being charged both for parking and car rental! You want to spend your money wisely and rent a car at the airport just when leaving Venice. 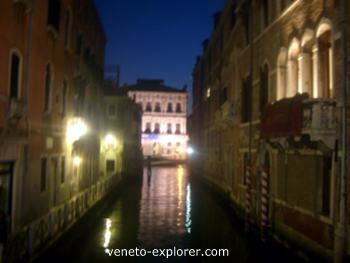 Many people think that you will find in Venice Italy's most expensive accommodations. It is true that the Veneto's town is on average more expensive than other Italian cities, but I guarantee that you can even spend some nights in Venice without going broke. You still have a wide range of choices in the lagoon town. Do not forget that Venice and tourism have been coexisting for centuries. Want to go for a luxury hotel? You are spoilt for choice as well, like one of those elegant palaces along the Canal Grande or nearby Saint Mark Square. What about a Venice honeymoon in a romantic and cozy hotel? Or in a more informal yet warm bed and breakfast? A B&B can be more reasonably priced compared to the hotels. There are plenty of them in the lagoon town. Some people choose to sleep in Mestre, an industrial suburb of Venice on the mainland. you should not miss the old town late in the day. I really suggest you experience the lagoon town at dusk. Mainly, if you get there during peak season, you can really enjoy a quieter town towards sunset, far from the endless and crowdy Venice tourism of the day hours. Venice is one of Italy's safest cities, so you can stroll around even in the back streets without fear. How to get to know Venice Italy? There are some must-see things in the capital of Veneto, which are on everyone's minds. I mean things like the Rialto Bridge, St Mark Square with its impressive basilica, the elegant Doge's Palace, the Grand Canal with its stunning aristocratic palaces, etc. If you are under a time constraint, though, relax and also explore out your guidebook author's itinerary...This italian town has way more to offer than just following the crowds. If you have time, then, take time and wander across the back streets, go away from the Venice of tourism, see where the real Venetians go to buy groceries, where they go shopping, the trattorias where they have lunch. You may end up having a much better lunch and for a more reasonable cost than the "just for tourists" ones. By the way, have a look at some of the Venetian dishes you should taste on your Venice getaway! Bring a map with and wear comfortable sneakers. Venice is in Italy, but it is not for high heels shoes. Do you want to dip into the authentic and far from tourism Venice, tasting wine and eating in the typical venetian taverns? Read about the Cannaregio district and the Jewish ghetto! Are you dreaming of a weekend break in Venice? Here a classic and relaxing itinerary with unmissable things to see. Venice Italy is surrounded by dozens of islands, some of them wild and uninhabited, others rich in history. All of them share a suggesting and timeless atmosphere, and are a great option for tranquillity lovers. More here about a day trip to the islands of Venice, among them Burano,known for its colorful houses and lace-making tradition. 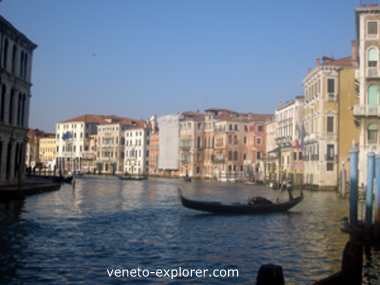 Looking for Venice Tourist Information? Check here!